DE International is a part and affiliated to the NSW Department of Education. They help to coordinate applications for international students to enroll and study at NSW government schools. They are responsible for conducting various programs for international students, students who are interested in studying abroad, schooling for temporary residents, study tours, student exchange and more. DE International believes in imparting quality education and they needed a platform to help students and their parents to understand the perks of studying in Australia. Their event focuses upon the various queries/challenges faced by students who want to study in Australia and the probable solutions. They wanted an event map which can host multiple events that they have planned through the year to help the international students. The homepage consists of a list of multiple events. The users can filter and create a separate list of events which they would like to attend. This feature has a list of the speakers and their session timings. This feature has an option to add it to your “favorites or wishlist”. The user will be notified about the session. The user can filter the sessions based on time and categories. Live Polling will help the event organizer evaluate the attendees’ response. The responses to live polling get recorded on the spreadsheet which is accessible to the organizer. This will help to make the changes in a jiffy. This feature will help the attendees to drift through the event venue easily and know the floor plan. This feature contains the list of the speakers and the sessions conducted by them respectively. After attending the session, the user can rate the speaker. This is an additional continuity feature to assess the speaker. This feature contains a set of feedback and survey questions. The audience can give their feedback which can be used by the organizer to analyze the attendees’ satisfaction about the event. Clicking on this feature navigates to the DE International YouTube page which contains the videos of their previous events. This gives the audience an idea about the event. This feature enables the user to get access to PDF files containing the complete details of the NSW program. 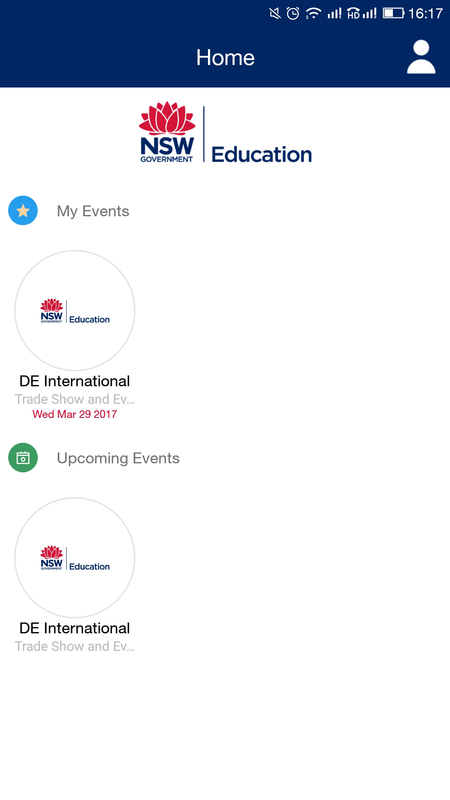 webMOBI helped DE international to develop a multi-event app. webMOBI’s multi-event app will help the organizers for conducting numerous events for an organization/company. The app will update the information for every event and the user need not download the app for different events. The one solution platform helps the organizers to have a firm attendees base and the users to get extensive information.